Our perceptions and understanding of dinosaurs have altered significantly since the first fossils were found and they continue to change as new discoveries are made. It’s a good job Tyrannosaurus rex isn’t around today to witness his street cred crumble under the weight of recent evidence that suggests he sported fluffy feathers as a youngster. Previously, the unwavering view was that all dinosaurs were covered in scales but in the past 20 years, scientists have become convinced that many meat eaters had fuzz or feathers. 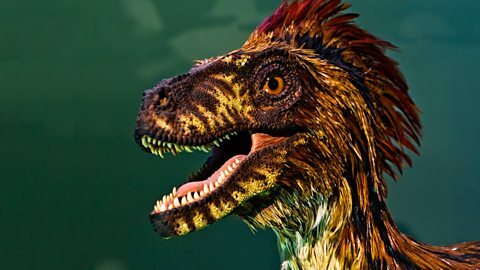 Prof Mike Benton explains how we know all small to medium-sized dinosaurs had feathers. Early on, scientists assumed dinosaurs must be cold-blooded, like lizards and snakes. Apart from some dissent in the mid-19th Century, this remained the prevalent view until the 1970s when new research declared that dinosasurs were warm-blooded, fuel-hungry beasts, like mammals. In 2014, some scientists mooted that they were, in fact, mesotherms – somewhere between hot and cold blooded. 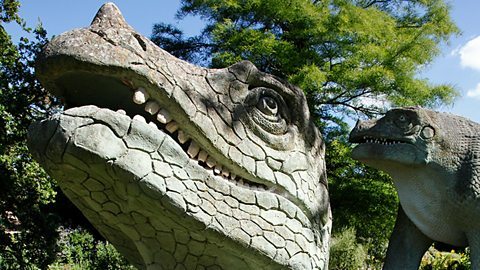 Modern research thumbs its nose at the Crystal Palace dinosaurs – the series of life-size sculptures in a South London park that was unveiled to the public in 1854. The models reflected a bit of confusion around the discovery of a small, pointy fossil. It was assumed to be a horn and a replica was duly stuck on the tip of the Iguanodon’s nose. Later, as more complete specimens were found, opinion shifted to it being a specialist thumb bone. There have been plenty of ideas about how the dinosaurs met their end. The currently accepted theory – which has been around for the last few decades – is that a massive meteorite collided with Earth and wiped most of them out. However, even this doesn’t explain why it saw off the dinosaurs but not all the birds, crocodiles and mammals. Earlier ideas centred on climate change and mountain building while some uncharitable early 20th Century souls claimed the dinosaurs ran out of steam as a species and gave up the fight. You might imagine that it would take some time to grow to the proportions of the largest dinosaurs. This, coupled with the assumption that they were cold-blooded, slow-growing reptiles, led to scientists estimating their age span at well over a century. But we now reckon that such beasts grew very quickly, with few living past 40 or 50 years. Steven Spielberg's Jurassic Park, released in 1993, packed the cinemas and filled the public imagination with some not entirely accurate impressions of dinosaurs. The Velociraptors, for instance, were too big, too fast, too scaly and too smart for the liking of many scientists. But they did hunt in packs, as the movie portrays. Since when has Hollywood let the facts get in the way of a good story? Go back a decade and experts were touting the theory that the largest of the dinosaurs must have been confined to water. The enormous weight and cumbersome tail of the Diplodocus, for instance, would not have been conducive to successful land-living, scientists argued, suggesting that it would have dwelt in swamps or lakes. Fast forward a decade and that theory is dead in the water. Scientists are now content that the giant herbivores lived on dry land. 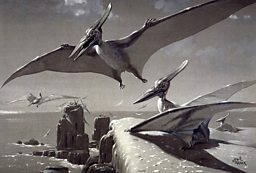 They shared the planet with T. rex and co. but the Pterosaurs were not dinosaurs, as was once believed. These flying reptiles of the Triassic and Cretaceous periods – the first vertebrates to take to the air – were a distinct group of animals, as were the marine reptiles of the day such as Ichthyosaurs and Plesiosaurs. Rewind to the late 19th Century and most had it that the T. rex was a fast-runner, fuelling our worst nightmares. By the mid-20th Century, that view was outpaced, with the monster thought to be somewhat slow and lumbering. Biomechanical models in the last few years, settle on something in between. 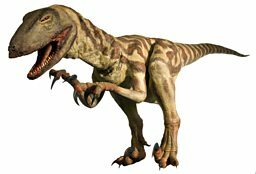 While turkey-sized dinosaurs could have taken on a racing greyhound, Tyrannosaurus' speed was estimated at around 29 km/h. For most of the time we’ve known about dinosaurs we’ve regarded them as flops – creatures that lacked the evolutionary nous to survive amid changing conditions. 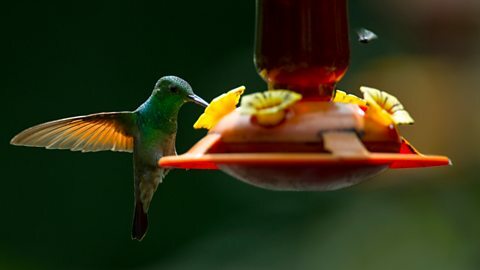 However, in the last 20 to 30 years, a new consensus has emerged that they were a fantastically diverse, resilient species that can boast thousands of living descendants in the form of birds. Paul Barrett from the Natural History Museum on the link between dinosaurs and birds. We do not know much about the noises dinosaurs made, although there is support for a 1970s notion that the Parasaurolophus used its crest as a resonating chamber, enabling it to communicate over long distances. 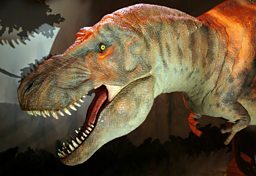 We do not know the colours of dinosaurs, although recent research has established the colour of feathers on dinosaurs like Sinosauroptreyx, which had orange and white rings down its tail. We do not know how intelligent dinosaurs were, although their tiny brain size, relative to body mass, suggests a limited IQ. Some had 15cm-long teeth while others had brains the size of a walnut. Watch a Natural Histories Comedy clip featuring a dwarf dinosaur. Brett Westwood explores how dinosaurs are influencing our stories, films and science. Prof Paul Barrett explains how dwarfing affected dinosaurs as well as modern animals. Find out if you've got enough bite for shark life. Ten reasons why Spielberg’s classic was so thrilling. Professor John Ó Maoilearca on the negative impact of Jaws on sharks and our perception of them. The Nineties. Blur, Damien Hirst, the Groucho… and the world’s most famous shark... It was ART, man.